As you can tell from looking at my blog, I love to cook! 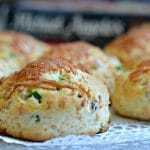 I love creating new recipes and modifying old ones. That said, sometimes I just don’t have time to make a whole meal from scratch. This is even more so the case now because I am currently six months pregnant and have two other little boys at home. When I can’t make everything from scratch, I still want to make sure that my family is eating well and that the food that they are eating is high quality and delicious. I recently discovered Michael Angelo’s™ Signature Line prepared meals in the freezer aisle at my local grocery store. There are many great varieties for everyone’s tastes, and they are all delicious! 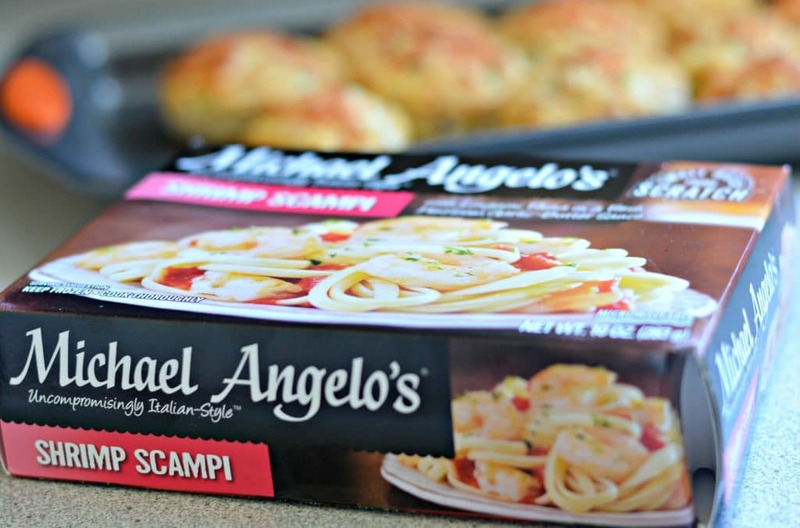 The first variety that I decided to try with my family was the Michael Angelo’s Shrimp Scampi which is made with linguini pasta, cooked al dente, and has plump, tender shrimp with a perfectly blended sauce made from lemon butter, and freshly diced garlic. It is then topped with diced tomatoes and garnished with a little parsley. I love this brand because it has real ingredients and no preservatives or artificial ingredients. To find locations where you can buy these products, click here. I love products like these, because they are so easy to make and because it allows me time to focus on side dishes as well. 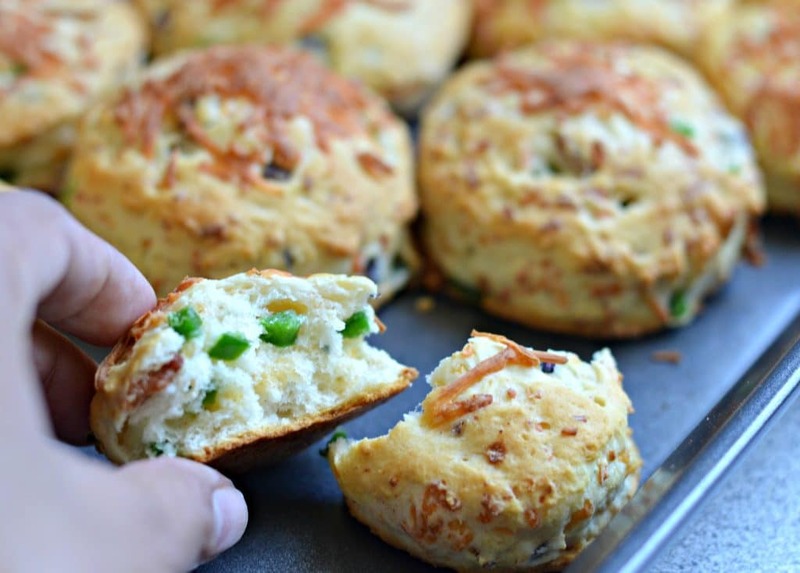 To go along with the Michael Angelo’s Shrimp Scampi, I decided to make some homemade, cheddar, bacon, and jalapeno biscuits. They turned out so good and didn’t take me long to make at all. 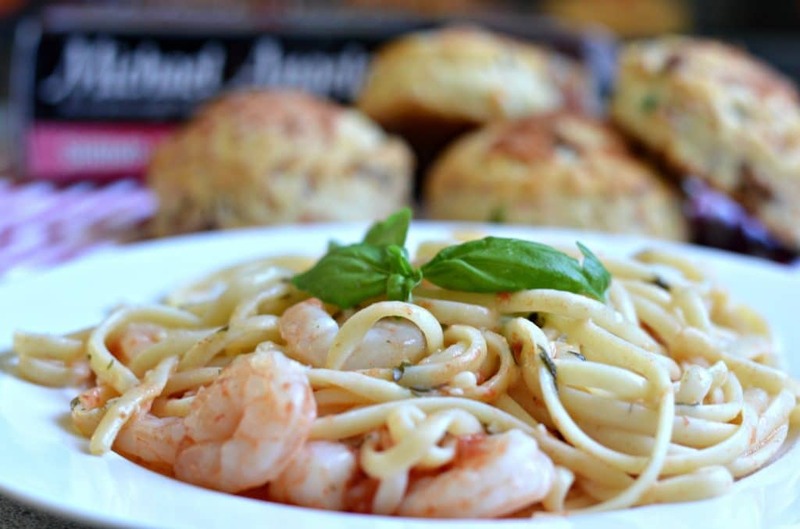 Together with the delicious flavors of the Shrimp Scampi, this made for an absolutely delicious meal for my family and me. I have to admit that in the past I was hesitant to serve frozen prepared meals to my family, but Michael Angelo’s has changed that for me. I feel completely confident using these products for my own family, and recommending them to all of you as well. 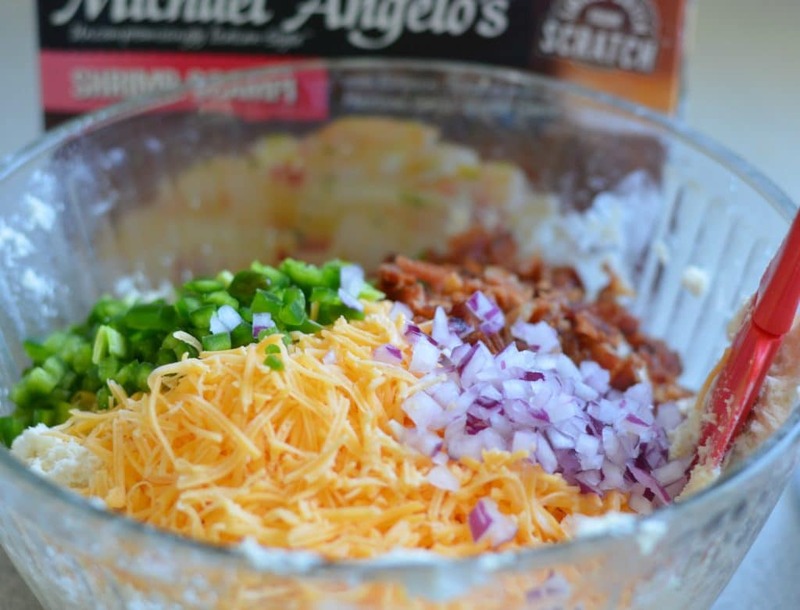 I hope that you enjoy this recipe, and don’t forget to get out and try Michael Angelo’s too! 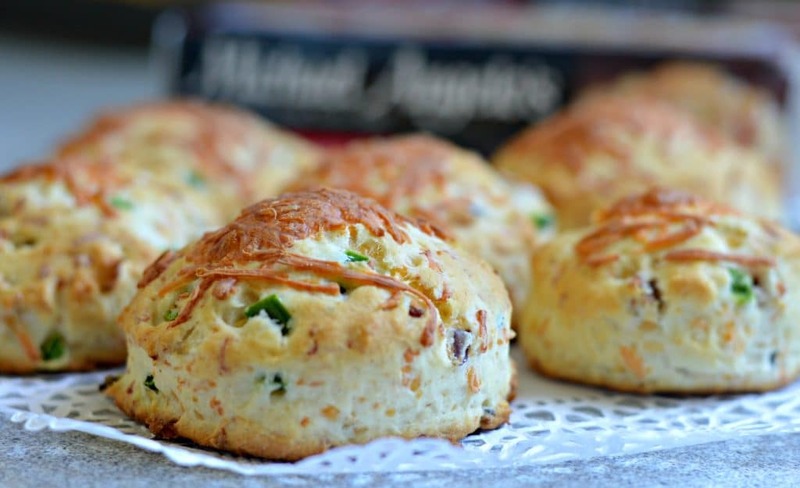 Combine flour, baking soda, baking powder and salt and beat with an electric mixer. Cut the butter into small pieces and add to the flour mixture from above, and continue mixing until crumbly. Add the buttermilk to the mixture and mix until combined. 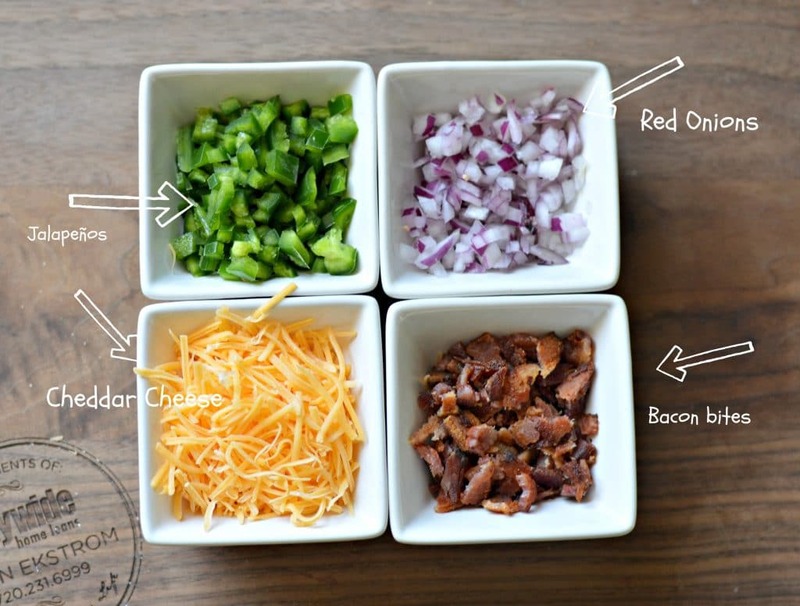 Add jalapenos, bacon, and cheddar cheese and mix until just combined. Move the dough to a floured surface and knead dough for about a minute and form a circle of about 1/2 - 1 inches thick. 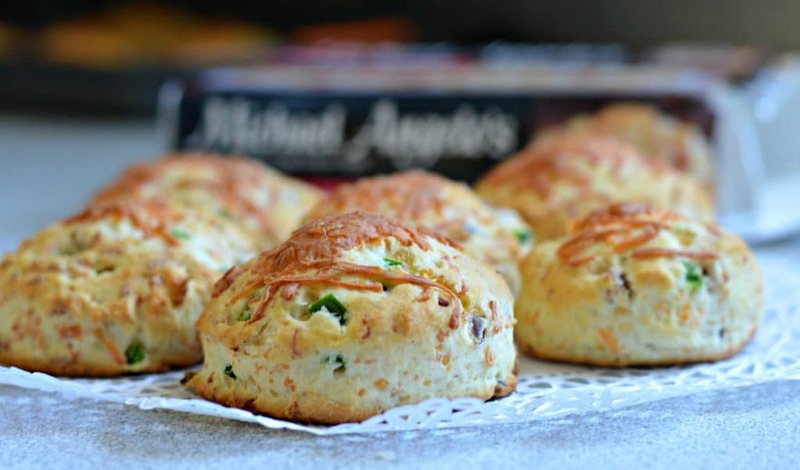 Use a cookie cutter or the top of a cup to cut out the biscuits, using all of the dough. Put the biscuits on a previously greased baking sheet. Bake for 12-15 minute, until golden brown.